We almost got through the entire season without any band/kicker incidents this season. It was nearly a miracle. And then the kicker of the Baylor Bears decided to ruin it for everyone! While performing at halftime today, the Texas Tech Goin Band found themselves with an unexpected visitor on the field. 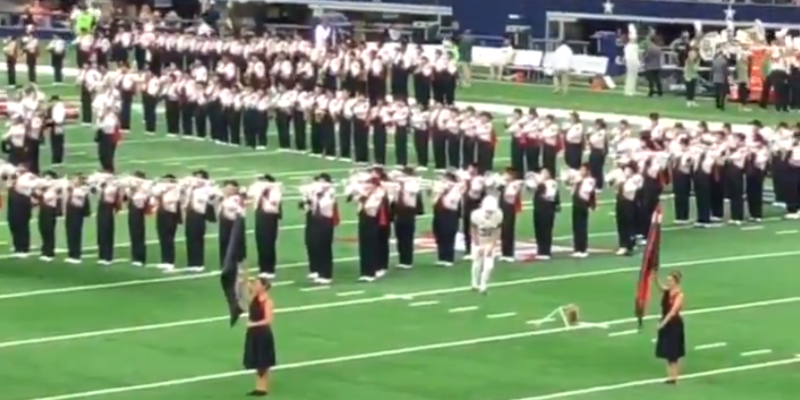 The kicker for Baylor came out of the locker room early as we've seen many times before and instead of waiting another 90 seconds for the band to finish their show he walked out into the band's formation and started kicking field goals. Even worse, he was told by a Texas Tech Goin Band Assistant not once, but twice to wait until the band was done. He acted like he was leaving, grabbed his stuff and moved to the other hash and started kicking again. Fans were not happy about it. The kickers need no more than 3 minutes to warm up before the half starts and the bands were off the field with more than four minutes to go. When a neutral site game like this allows both bands to come, there is an agreement made about the time the bands will have at halftime. They did not go over the time they were allotted. Beyond that it is just unnecessary to put the kicker and band members in harms way. He doesn't know the drill. He doesn't know where band members may march to and if the band were to be marching backwards the members could easily fall into him or over the ball. He is putting both himself and the band members in harms way. STAY OFF THE FIELD UNTIL THE BAND IS DONE!